When I was a teenager I never really thought about stamina. I just took it for granted. It was just there. If I wanted to do something, I just did it. Today is so different for my 40-something body. 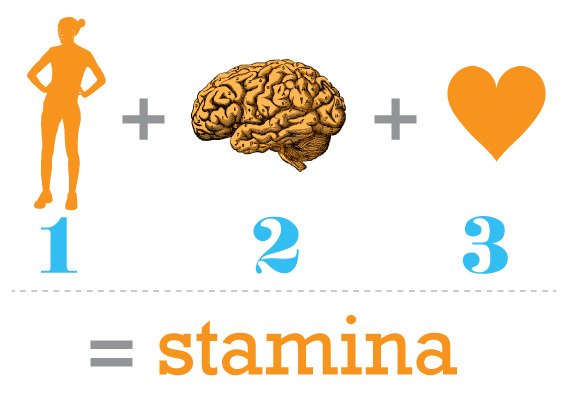 When I think of stamina it really comes down to extending further than yesterday. At least that is what builds it. The reality is this isn’t always easy. Building and maintaining stamina has three main components for me – my body’s willingness to participate, my mind’s can-do attitude, and my spirit’s drive to expand. Earlier this summer I revised my activity (I went from none to some). My mind and spirit were the first to participate as they both were all in. At first I would just put the gym clothes on and get tired. That was it. The clothes were on and that was good enough for the day. Then I would get dressed for the workout, go to the gym, and sit in the lobby & drink tea. This might not seem like much, but this actually was building my stamina. My body was getting caught up to my mind and my spirit. Once I was able to add in movement my body rewarded me with weight loss, slightly sore muscles, and a sense of calm. Eventually it actually started to crave even more exercise and wanted more challenges. I noticed that people would comment at how much I smiled and that I seemed really happy. I also have the strength to do more. I am cleaning out closets, yard work, and even climbed up on the roof to clean the gutters. Stamina – I am so grateful for an old friend that I found again.